Product code: es7099 Categories: Modern & Retro Jewellery, Modern Rings & Engagement Rings. Here is an exceptional quality aquamarine and diamond ring hand made in platinum that stands out from any other aquamarine that you will ever see. Firstly about the ring. 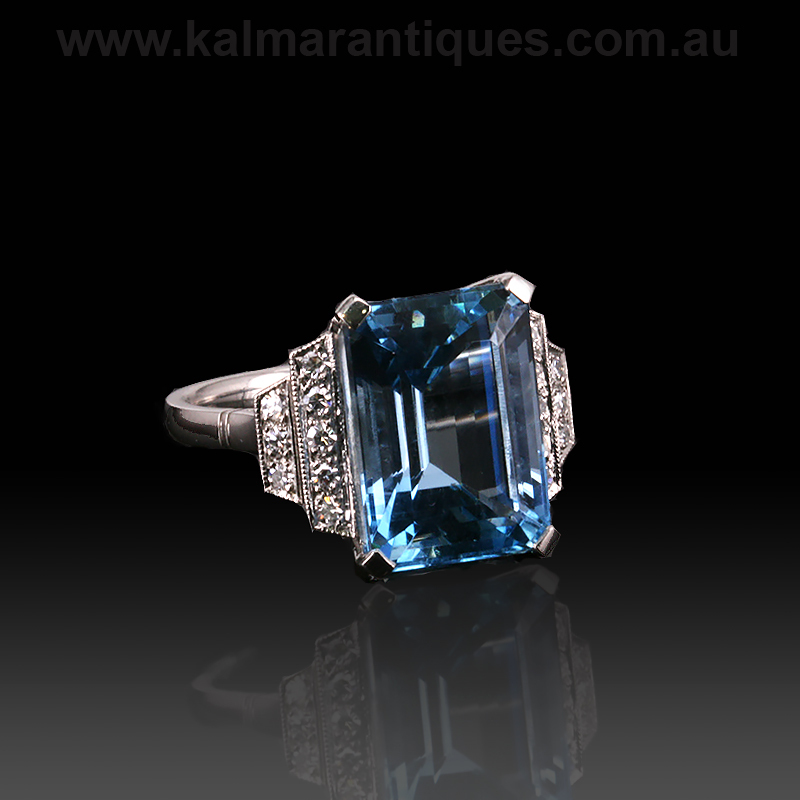 The aquamarine and diamonds were from an original Art Deco ring dating from the 1920’s that was very badly damaged and repaired over the years, so there was no choice but for us to remake it. Keeping true to our love of antique rings, we not only used the original stones, but also the design. This really gives the best of both worlds for someone who wants a new ring in the style of the past. Being hand made also gives to much more strength and fine detail over the other technique of making jewellery today that have simply been cast and copied all the same sometimes in the hundreds. And now about the aquamarine. This aquamarine will be easily the finest and most intense quality aquamarine that you will ever come across. 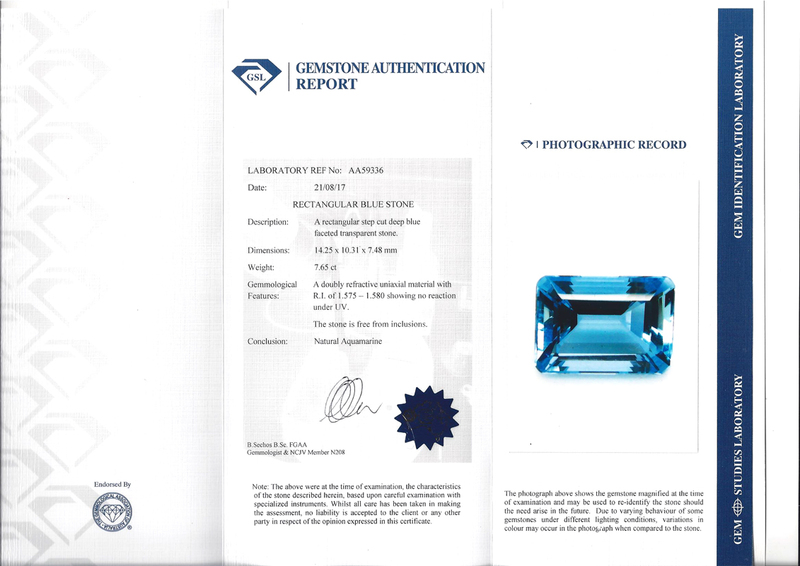 Certified by Gem Studies Laboratory in Sydney as not only being a natural aquamarine weighing 7.65 carats, but it is also flawless. The intense colour of this aquamarine stands out even more set against the pure white of the platinum and the diamonds. The beautiful straight angular lines of the aquamarine match perfectly with the straight lines that the diamonds are set into, and the setting itself measures 14.9mm by 17.5mm from one row of diamonds across to the other. In total there are sixteen single cut diamonds with a total weight of 0.22 carats and from the side you can see the elegant and very stylish lines. There is no doubt that this is an aquamarine of exceptional quality and one ring that will always be admired and appreciated. Tag: Aquamarine and diamond ring. Exceptional quality aquamarine and diamond ring hand made in platinum. Set with the finest quality aquamarine that you will ever find. This certified aquamarine has such an incredible colour and is certified as not only natural but flawless.